Coby Electronics Corporation and Ingram Entertainment Inc. were selected as this year’s Golden Carrot Award winners by demonstrating a solid commitment to providing innovation, service and cutting-edge products to the incentive market. They were presented with their award during a ceremony at Hinda’s headquarters in Chicago on Tuesday, Oct. 4. Hinda’s Golden Carrot Award honors supplier partners who have consistently demonstrated dedication to the field of incentives. Dave Peer, Executive Vice President of Hinda, shared the following on this year's award recipients. "Ingram Entertainment has been a key partner in the launch of our infinitE® award offer with the thousands of SKU's they add to our assortment. We are so pleased to be working with them as we launch this expanded offer." Peer continues, "Coby has proven to be one of the emerging brands in the consumer electronics industry and we are very happy to be working with them. They have provided great support to us and we know we can rely on them to respond and perform, as top tier suppliers do. We are pleased to recognize both Ingram and Coby with Golden Carrot Awards." Jeffrey Beck, Director of Interactive Media Sales for Ingram Entertainment, accepted the Golden Carrot on behalf of his company, while Craig Hassler, Director of Sales, accepted the award on behalf of Coby Electronics Corp. Selection for the Golden Carrot Award is highly competitive. The extensive list of criteria for winning suppliers include innovation, high quality products, timeliness of deliveries, prompt follow-up, the ability to provide updated product information and reliability, among others. Rick Bowen (L), Merchandise Manager, and Dave Peer (R), Executive Vice President, stand with representatives from Ingram Entertainment Inc.
Rick Bowen (L), Merchandise Manager and Dave Peer (R), Executive Vice President, stand with representatives from Coby Electronics Corporation. Sometimes, it's easiest to learn a concept through visualization. Take employee motivation for example. There isn't a solid, clear-cut definition of it out there. Often times, it involves trial-and-error practices and personalization in order to be successful. But, to aid in our understanding, IncBlot has created the following infographic. It explains the theory and ideas behind motivation, the motivation equation in the workforce, action steps, questions to consider and useful statistics. Action Step: Ask a team member what non-monetary rewards they might find motivational. As an employer, how do you motivate your employees? As an employee, what motivates you to work? Leave a comment and let us know! In the August issue of Dealerscope magazine, statistics from the DisplaySearch Q2'11 Quarterly TV Design and Features Report were released. 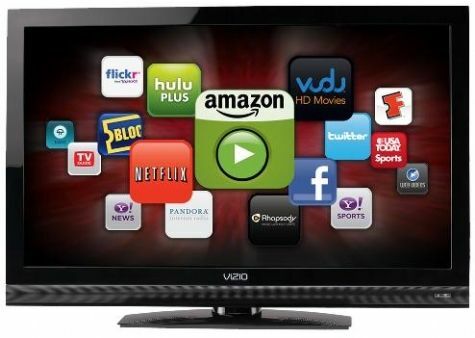 The survey showed that in 2011, more than 25 percent of all flat panel TVs shipped are expected to have some form of Internet connectivity. And, according to the report, this number is forecast to hit 140 million by 2015, accounting for 47 percent of all flat panel TVs shipped. Products launched by TV manufacturers in 2011 show how important Internet services are to the future of TV. Internet-ready, these televisions partner with other handheld devices in the home, such as smartphones and tablets. This allows consumers to use their technology devices across platforms - a growing trend in the industry. What does this mean for the future of 3D television? While we can't be certain, it looks as if manufacturers are favoring Internet-ready TV over 3D. Given that there aren't enough resources or invested software in 3D technology, consumers have struggled to fully adopt it. When looking for a way to reward your employees or customers, it's easy to turn to the age-old, traditional gift ideas like pens, t-shirts, stress balls and thumb drives. But, are these effective alone? The minds behind Flowtown thought not. They had the brilliant idea of putting all traditional gift ideas together to form one perfect super-gift. While I can't say with certainty, I'm fairly sure this is a parody. Given the humorous descriptions of each item, I sense that this super-gift isn't going to be at the top of any employee or customer's wish list. But still, it's worthy of a laugh. Can you think of any other traditional items that may be missing from this? Or, did they capture all of them? Instead of combining all of the traditional corporate gifts together to create one perfect gift, perhaps the best solution is to let your employees and customers select their own gifts. We specialize in points-based reward systems. We understand all of the important elements to a successful reward program and have all of the resources available to support your needs. According to joint research between Corporate Meetings & Incentives magazine and the Incentive Research Foundation, merchandise incentives are on the rise. The Merchandise Trends Survey was conducted in spring 2011 in order to identify the latest trends in the corporate incentive market. A total of 160 respondents who plan incentive programs or purchase incentive gifts responded to the survey. Comparing the results from this year with last year, it's clear to see that more companies are returning to merchandise as a way to reward salespeople and retain customers and employees. In 2011, 11% of companies canceled their merchandise incentive programs. In 2012, only 6% plan to cancel. In 2011, a majority (24%) of respondents spent between $50 and $99 per gift. In a close second, 23% spent between $100 and $249 per gift. There you have it! Which statistic surprised you the most? Given these findings, what do you predict for the industry in 2012? Our CEO, Michael Arkes, recently wrote a guest post for Premium Incentive Products Magazine. In addition to being our CEO, Arkes is also the founder of Helping Hand Rewards, which serves as a catalyst between incentive companies and social purpose businesses that produce merchandise. The article discusses the importance of corporate social responsibility (CSR) - on both macro and micro levels. CSR contributes to corporate success by enhancing corporate reputation, building brand loyalty, increasing sales, attracting investors, improving recruitment and retention, and increasing employee engagement. Below is an exerpt from the article. "There is growing recognition that businesses bear a responsibility for what happens in this new world. Beyond turning a profit and producing quality goods and services, they are expected to consider the impact of their actions not only on their shareholders, but also on their customers, employees, suppliers and communities. Practiced by businesses of all sizes in just about every industry, corporate social responsibility takes a wide variety of forms. It can include green and sustainable business practices, philanthropy, business-relevant volunteerism, cause marketing and community activism. It also can be reflected in a company's basic corporate culture—including diversity and inclusion policies, compensation and benefits packages, and work-life balance initiatives—and in its procurement practices and supplier relationships." Read the full article here. Do you think corporate social responsibility is an important business practice? How so? And, in what ways can companies become more socially responsible? Drop a comment and let's discuss. Helping Hand Rewards helps connect social enterprises that produce merchandise and businesses who are looking to enhance their rewards and recognition programs while improving their role in corporate social responsibility. HHR products can add new meaning to your incentive programs and are good for business. From gourmet brownies to spa gift sets, utilizing products that were manufactured by a social purpose business creates added value for the sponsoring company and the recipient, while giving back to the community. Contact them for more information.